The following excerpt, from a brochure, published on behalf of the All Saints and Time to Soar groups of laity and clergy who support women’s ordination, has just been distributed to serving and retired pastors throughout Australia. 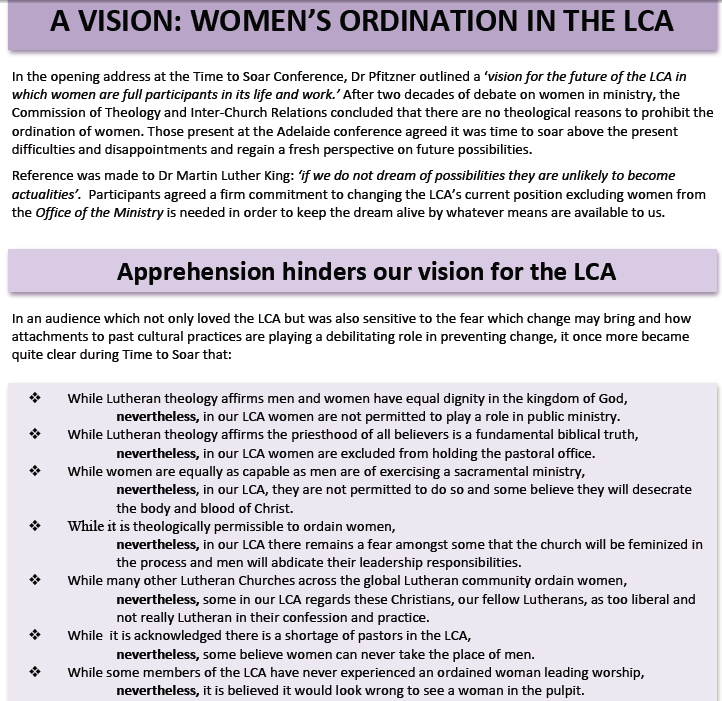 A VISION-Women’s ordination in the LCA. Another document published at the same time is found on Katie and Martin and here: Senior Lutheran pastors affirm the ordination of women. It has come to our attention that St Stephen’s Lutheran Church, Adelaide are planning a conference on women’s ordination, July Fri 13 – Sat 14th this year. It is certainly time that there was change in the LCA. This could be the catalyst to bring it about. Would you please consider being part of this event to ensure that women’s ordination happens soon in the LCA? The following letter is from Dr Neville Highett –Chairperson St Stephen’s Lutheran Church.